DISCLAIMER: The following represents current thinking of the BEOS team and is subject to change without notice. Nothing should be interpreted as a statement of fact or promise to do anything. It is released here for community discussion purposes only. Abstract: BEOS is a straight clone of EOS.IO software and as such shares a common white paper with a few key differences. These differences primarily relate to the number of tokens, how they are initially distributed, support for gateway interfaces to BitShares making tokens portable across the two chains, and issues of governance. Future planned differences will make block signing nodes aware of their jurisdictions and smart contracts able to specify which jurisdictions may execute them. Additional planned changes will optimize the software for operation on satellites in international space and separate providers of hardware from operators of node software into separately elected roles. Most importantly, BEOS is a middle chain that we can modify freely to interface BitShares with the EOS main chain and the greater EOS ecosystem. EOS.IO introduces a new blockchain architecture designed to enable vertical and horizontal scaling of decentralized applications. This is achieved by creating an operating system-like construct upon which applications can be built. The software provides accounts, authentication, databases, asynchronous communication, and the scheduling of applications across many of CPU cores or clusters. The resulting technology is a blockchain architecture that may ultimately scale to millions of transactions per second, eliminates user fees, and allows for quick and easy deployment and maintenance of decentralized applications, in the context of a governed blockchain. PLEASE NOTE: CRYPTOGRAPHIC TOKENS REFERRED TO IN THIS WHITE PAPER REFER TO CRYPTOGRAPHIC TOKENS ON A NEW BEOS BLOCKCHAIN THAT ADOPTS THE EOS.IO SOFTWARE. THEY DO NOT REFER TO THE ERC-20 COMPATIBLE TOKENS BEING DISTRIBUTED ON THE ETHEREUM BLOCKCHAIN IN CONNECTION WITH THE EOS TOKEN DISTRIBUTION. DISCLAIMER: This BEOS white paper is a supplement built on top of the EOS.IO Technical White Paper v2 from block.one and is for information purposes only. Terradacs and block.one do not guarantee the accuracy of or the conclusions reached in this white paper, and this white paper supplement is provided "as is". Terradacs and block.one do not make and expressly disclaim all representations and warranties, express, implied, statutory or otherwise, whatsoever, including, but not limited to: (i) warranties of merchantability, fitness for a particular purpose, suitability, usage, title or non-infringement; (ii) that the contents of this white paper are free from error; and (iii) that such contents will not infringe third-party rights. Terradacs, block.one and their affiliates shall have no liability for damages of any kind arising out of the use, reference to, or reliance on this white paper or any of the content contained herein, even if advised of the possibility of such damages. In no event will Terradacs, block.one or its affiliates be liable to any person or entity for any damages, losses, liabilities, costs or expenses of any kind, whether direct or indirect, consequential, compensatory, incidental, actual, exemplary, punitive or special for the use of, reference to, or reliance on this white paper supplement or any of the content contained herein, including, without limitation, any loss of business, revenues, profits, data, use, goodwill or other intangible losses. 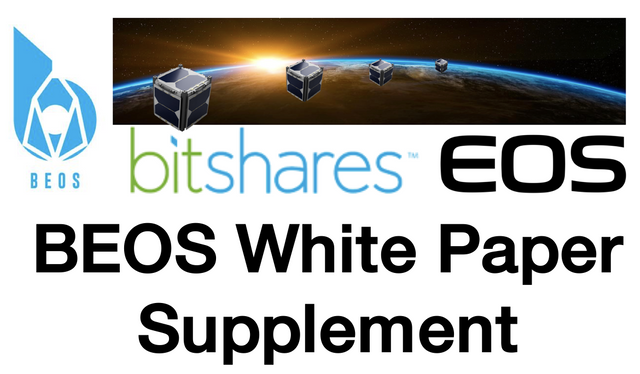 BEOS is a unique opportunity for BitShares holders to partake in and benefit from the advanced technology that EOS provides, particularly with regard to smart contracts. The primary ways BEOS will differ from the EOS main chain will be token distribution, governance, and an entirely new approach to censorship resistance. BEOS tokens will only be available to a Targeted Demographic consisting of BitShares and BROWNIE.PTS holders that stake their tokens to earn BEOS during the “rainfall” period and a BEOS Endowment Fund which serves in place of the BitShares Reserve fund to support growth and defense of the BEOS ecosystem. In this way, BEOS can be seen as a way to bring the benefits of a smart contract platform to BitShares without needing to buy EOS tokens or give up their BTS. BitShares EOS tokens will be known as BEOS and work almost exactly like EOS tokens. They will be allocated to members of the Targeted Demographic that stake their tokens according to the process outlined here. 100% of these tokens will be distributed to members of the Targeted Demographic who wish to claim them over a period of Seven Weeks, Forty Days and Forty Fortnights (i.e. 89 days for BEOS and 80 weeks for RAM). BEOS will have an unapologetic blend of public/private, centralized/decentralized, compliant/iconoclast, and open/closed features. We have not let ideological purity get in the way of seizing new territory others have neglected in the name of traditional blockchain dogma. BEOS will break from blockchain tradition, embrace new thinking about censorship resistance, and pursue a radically new approach to achieve mainstream adoption. BEOS is being developed by Dan Notestein of blocktrades.us fame under contract to Terradacs, Limited, a privately-funded development company based in Malta. Dan has been a contractor from the beginning of BitShares, working for Invictus Innovations, Cryptonomex, and a multitude of other graphene projects. Terradacs is directed by CEO Paul Martello . Funding to put BEOS into space is being provided by Sovereign Sky, a joint venture between Terradacs and Ruon led by Tim Burke. Satellite technology is being provided by SpaceQuest. Blockchain and distributed ledger technology is truly revolutionary and has the potential to change our economic system, the way humans interact with each other, and the Internet itself. Indeed, we are witnessing something massive beginning to take its rightful place in the world and in our lives. Bitcoin was the revolution that changed everything. It is excellent for highly secure and highly censorship resistant transfer of value. It was the first technology that enabled two individuals to exchange funds without the need for a trusted third-party. While revolutionary and the best at what it does, its functionality is limited. On-chain transactions are slow, and sophisticated smart contracts simply are not possible on the Bitcoin network. BitShares was the beginning of the evolution. It showed that complex unmanned companies could be hosted on the blockchain with highly-optimized embedded smart contracts used to implement smart coins and other services. Ethereum followed a year later, demonstrating how complex decentralized applications could be deployed and run on a blockchain. It demonstrated that a blockchain could do far more than simply process transactions. Developers flocked to develop on the Ethereum network and thousands of projects launched tokens of their own. Like many things, Ethereum became the victim of its own success. The world wants to use a platform for decentralized applications, but Ethereum could not handle the load. One successful project on Ethereum can and has brought the network to its knees. The blockchain has become so bloated that a normal user would have a difficult time running a full node. Graphene (the tech behind BitShares 2.0 and a year later Steemit) was the next major evolution of blockchain technology. They were the first demonstrations of at least two extremely important leaps that made mainstream adoption viable. First, they showed the world that using a blockchain could make a user feel like they are using intuitive software and not something complicated only for the technically savvy. Second, these projects demonstrated that decentralized applications could scale far beyond what anybody thought was possible. The importance of graphene technology cannot be overstated in the world of blockchain. 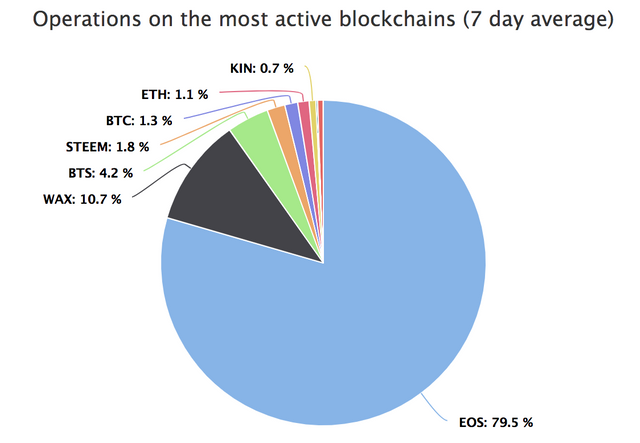 Today, BitShares and Steemit remain vibrant communities that taken together with EOS chains, comprise a commanding majority of 94% of all transactions across all blockchains. EOS is the most recent important evolution in blockchain. The creator of graphene technology (BitShares and Steem), built upon the underlying technologies in BitShares and Steem to create a platform where anybody could develop and deploy scalable decentralized applications. EOS is still in its infancy, but is already handling more transactions than any other blockchain.. EOS is the first real blockchain contender that is capable of supporting user-defined decentralized applications that can scale. Unfortunately, cryptocurrency enthusiasts that supported the first implementation of graphene technology (which led to EOS), BitShares, have been provided no way to participate in the new EOS ecosystem apart from buying tokens. BEOS will bring the BitShares and EOS worlds together to ensure that they benefit one another. Perhaps of equal importance, BEOS seeks to evolve the entire concept of censorship resistance so that companies can operate on the blockchain with total regulatory certainty. We consider all graphene technology to be part of the same family and BEOS will provide the link between EOS and BitShares. It will connect these distinct ecosystems so that the products and services can flow freely between them. BEOS can be viewed as an optional free upgrade to both BitShares and EOS. Those who do not want to benefit from these improvements are free to ignore the upgrade and both universes will remain unchanged to them. BEOS will utilize the EOS software as developed by Block.one as its default with some key differences that are outlined in this document. An important design consideration is to keep BEOS as compatible as possible with EOS so that it can enjoy the never-ending flow of new technology from the EOS developers as soon as it is released as open source. Meanwhile, BitShares will continue to offer its unique advantages to the EOS ecosystem, unconstrained by some of the philosophical design decisions made by that community. This means that BitShares and EOS holders can enjoy the best of both worlds and continue to evolve together. In this way, there is no real advantage to building an alternative to BitShares on top of EOS, though no doubt some will still seek to do so. When accessing BEOS via the forthcoming BEOS API, BitShares and EOS chains will ultimately appear as a single “braided” blockchain with a nearly seamless fusion of all features. This may become more seamless over time to the extent that BitShares holders vote to extend their software to support side chain functionality, but it is not necessary for BEOS to function. Bitcoin, Ethereum, BitShares, Steem, EOS, and most blockchains are designed to be inter-jurisdictional, spread out over many jurisdictions, under the theory that if some government shuts down nodes in one jurisdiction, the network will simply heal itself with nodes in the remaining jurisdictions. This is much like the Internet itself which was designed to survive nuclear war by routing around smoking craters. However this jurisdictional unpredictability presents a major problem for companies that require regulatory certainty. While inter-jurisdictional blockchains make it virtually impossible to stop a particular transaction, they provide no protection to the person or group conducting the transaction. When considered from this perspective, blockchain transactions can be easily censored after the fact. People can be arrested, property can be seized, and organizations can be fined or shut down. BEOS seeks to develop a new kind of censorship resistance by designing the blockchain to be "intra-jurisdictional" (confined to one jurisdiction) and ultimately "jurisdictionally agile" (able to control which operations take place in explicitly designated jurisdictions). To be clear, this is not an attempt to limit the kinds of transactions that can be conducted on BEOS. Instead, it is intended to provide certainty for individuals and groups that want the protection of blockchain-friendly jurisdictions. If a company has to wonder if their transaction or operation will take place in a jurisdiction where they are violating the law, censorship resistance has little practical value. Beyond the desire to integrate BitShares into the well-funded and rapidly evolving EOS dominated ecosystem, a desire to implement a stronger capability to confine a class of transactions to the jurisdictions that permit them has guided the design of BEOS. The belief is that adoption by many industrial and institutional players will be encouraged if they can be assured of regulatory simplicity, clarity and compliance for their business processes. Block producing equipment will be highly specialized and located in specific predetermined locations. Elected block producers will have control over the software running on this equipment but not necessarily control over the machines physically unless they happen to be in the same location. This will ensure that nodes are run in specific jurisdictions and that the best possible equipment is being used. 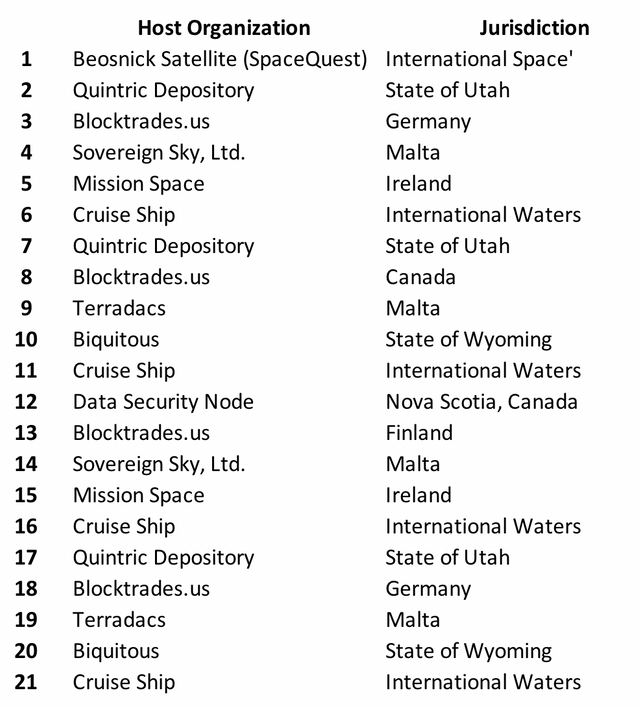 For example, nodes may eventually run in the following locations: on a satellite in space, on a ship at sea, in Utah, and in Ireland. When elected to the role of block producer, that individual or organization will be issued control over a specific instance of node hosting hardware while remaining responsible for providing backup hardware of their own choice. There are clear advantages to engineering a jurisdictionally-agile blockchain that can guarantee that specific actions and transactions take place completely inside permissive jurisdictions. More importantly, it removes all doubt about which laws may apply. This creates certainty for organizations of all types who find the current regulatory patchwork too risky and difficult to navigate. The legal viability of such a strategy is certainly untested, but the benefits of regulatory certainty are clear and very much needed. BEOS will blaze the trail on this area by guaranteeing to organizations that their transactions are taking place in a jurisdiction where they know themselves to be compliant. Being able to guarantee that there are no such vulnerabilities may be a highly sought feature by those capable of bringing a large volume transactions to the BEOS platform. This would be a unique benefit and feature that no other blockchain has ever been able to offer its developers. BEOS will be launched by an appointed group of block producers that are selected by a founding team. Once the network is launched and determined to be stable, BEOS holders will be able to elect the block producers according to the standard voting mechanism in the EOS software. The difference will be that block producers will run on specialized private equipment in particular jurisdictions. Simply put, BEOS separates equipment providers from elected node operators. Here is a tentative list of initial equipment providers subject to change without notice. This is a different way of thinking about censorship resistance than conventional blockchain thinking would normally support. It may also be the major factor holding entire industries back from participating in the cryptocurrency space. It will be controversial among those trained in Bitcoin conventions, but could open the floodgates for businesses that will never never participate in the current blockchain environment due to regulatory uncertainty. One of the key BEOS design objectives is to make all tokens on the BitShares network portable -- able to move freely from the BitShares blockchain onto the BEOS chain and from there out into the multi-chain universe of the EOS main chain and its side chains. 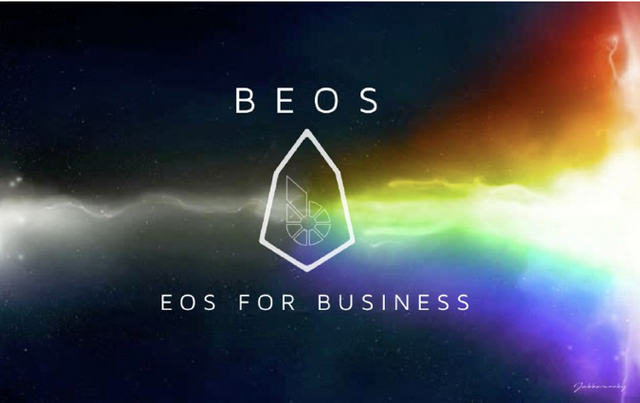 In fact, the pairing of BitShares and BEOS will make BitShares appear to the rest of that EOS universe as just another EOS chain. Ultimately, this vision will be accomplished with whatever atomic side chain communication mechanisms are developed by the greater EOS community. However, BEOS need not wait for those breakthroughs, and permission to implement it from BitShares voters, to begin operations. Instead, one or more service providers can provide gateway functions that will lock up a token on its home chain and reissue a surrogate token on one or more side chains. Users will simply send tokens to a gateway addressed to an account on another chain and the token will appear to vanish here and reappear there. Those familiar with blocktrades.us will find this very natural. In order to obtain BEOS tokens, BitShares or BROWNIE.PTS tokens must be transferred from the BitShares chain to the BEOS chain using the cross-chain transfer gateway described above. While their tokens reside in an account there, that account will receive a steady "rainfall" of BEOS for the duration of the raindrop. BEOS rainfall will last for at least 89 days during which BEOS tokens will be continuously distributed at a preprogrammed rate. There will be a total of 2.5 billion BEOS tokens distributed, with all of them falling in the first 89 days. The Targeted Demographic will be able to begin participating at any point during the rainfall period. However, the longer tokens are staked, the more BEOS tokens can be accumulated. During the first 89 days of rainfall, all accumulated BEOS tokens will remain locked from spending or trading. This will ensure that no BEOS tokens are traded until all tokens for that period are distributed. The benefit of this method is to ensure that no tax liability is created (in relevant jurisdictions) for new BEOS token holders because the tokens will have no market value until they are unstaked and then tradable. After the 89 day locking period ends, the BEOS tokens may freely trade and thus take on a free market value that may become taxable as income in some jurisdictions. Participating tokens from the Targeted Demographic transferred to the gateway accounts will be held until a user withdraws them, presumably at the end of the extended rainfall period. Therefore, it will not “cost” anything to obtain BEOS beyond the effort to move them between the two chains and the delegation of proxy voting power to the gateway operator entrusted to vote for BitShares policies and worker proposals favorable to deeper BEOS integration. Participation may be for any amount of time with distributions taking place at maintenance interval rates. Note that the Targeted Demographic for BEOS token distribution does not include EOS holders according to EOS conventions in the same way that the distribution of EOS tokens or STM tokens does not include BTS holders. This is to keep these communities isolated from any regulatory entanglements they may individually encounter associated with token distribution. Instead, the precedence has been established by Steemit and EOS developers that all members of the graphene family will honor each other by freely using and sharing each other's publicly licensed open source code. Block.one has no role in BEOS and we do not foresee any circumstances in which they will get involved. Therefore, we do not foresee them utilizing their own funds to help develop the BEOS ecosystem. BEOS will still benefit from upgrades and improvements Block.one develops and releases as freely-licensed open source software because the two chains will essentially be the same and it will be easy to import any EOS upgrades to BEOS. BEOS will need to fund certain important endeavors to protect the network. A BEOS Endowment Trust Fund will be created for this purpose, but it will not be managed on the blockchain like the existing BitShares Reserve Fund. Instead, it will be managed by a traditional legal trust fund, the BEOS Limited Cooperative Association ​(“BLCA”). This is for pragmatic reasons. A conventional board of trustees is able to make contracts, act quickly, and maintain commitment to a plan longer than a purely democratic process can achieve. This is another way where BEOS may be thought of as a hybrid chain built to be efficient and pragmatic, not ideologically pure. Initially, the Trustees of the fund will be selected by the founding BEOS team. After launch, trustees will be elected on a staggered basis much the way that Commissioners in the American SEC serve their terms. One trustee will rotate out and be replaced each year with another who will then serve a five-year term. This is intended to maintain some stability for the fund so that a long-term vision can be developed and executed while control transfers from those appointed by the developers to those elected by the community. Elections will be conducted by the Trustees, perhaps using special tokens that are issued for the specific purpose of electing Trustees. Election tokens may be issued by the Trustees in direct proportion to the amount of BEOS held in each account over a period of time. In order to vote for a specific trustee candidate, the BEOS holder must simply send their election tokens to that candidate. At the end of the election period, the candidate with the most election tokens wins and will become a Trustee. This offers a fully transparent and simple method for token holders to participate in trustee elections. This process is subject to change by unanimous decision of the Trustees and may turn out differently in your particular universe. The responsibilities of the fund will include rapid legal response to defend the network and its participants to make grants for the defense and welfare of the blockchain industry at the discretion of the trustees. It will be funded with 1 billion BEOS tokens to ensure that there are sufficient resources. The Trustees will hold the right to vote for block producers and participate in governance related votes. This results in a bicameral form of government, initially with 2/7ths (1B BEOS) of the voting power residing with the Trustees and 5/7ths (2.5B BEOS) residing with the holders of the circulating supply. If the Trustees gradually spend their fund into circulation their voting power will decrease, although the fund is envisioned to function like an endowment to be borrowed against or used to generate income for the Trust, ideally without touching the initial principle. Block Producers will be paid from a small amount of inflation, not to exceed the max rate already established for EOS. 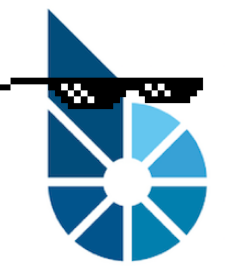 While participants in the rainfall have their BTS locked up in escrow backing corresponding proxy tokens on the BEOS side, they are explicitly licensing the BCLA trustees to vote those BTS for the good of BEOS integration with BitShares. This should increase the value of the BEOS rainfall they are collecting, by supporting closer BTS integration. BEOS will take a pragmatic approach using trust engineering techniques drawn from traditional human in the loop trust structures for governance combined with incorruptible blockchain technology for asset ownership and smart contracts. Depending upon willingness of the BitShares community to support tighter integration, this may change over time. RAM and how it's distributed has been a major point of contention on the EOS main net. RAM speculation has led to hoarding which has driven the costs of deploying software far higher than it should be. RAM should be allowed to trade on the open market but the Bancor algorithm is not the open market. It can be easily gamed and has been to the detriment of developers and token holders. Decoupling EOS token ownership from ownership of RAM has had negative consequences for the entire EOS network and arguably, the price of EOS tokens. It has created a massive disparity between the cost of RAM and all other network resources. Telos is proposing an alternative RAM distribution strategy where the Telos Foundation will attempt to control RAM prices through controlling supply. Both the EOS and Telos models have merit but neither is ideal. They have effectively removed the most valuable part of the network from token owners forcing them to spend their tokens simply to utilize the network. Network resources should be allocated to the token owners in proportion to their token ownership. 2.5 billion BEOS tokens will be distributed to members of the Targeted Demographic that store their tokens on the BEOS platform over an 89 day period to be announced. 1 billion BEOS tokens will be rain dropped to the BCLA Trust. Regardless of what may be stated in this White Paper Supplement, the only source of official information is contained in the source code that may or may not be an attempt to imperfectly implement its ideas. No one should rely on anything said herein for taking any actions whatsoever in the real world in which they are living. This document is published by Terradacs, Ltd. and subject to change without notice. Nice, how long before we can position our BTS? Your idea sounds very creative. As Dan's father, you obviously are aware that EOSX (decentralized exchange) is coming soon on EOS. What are your feelings about that? It will be assimilated into BitShares via BEOS. Resistance is futile. @stan how about MEOS or steem-engine smts? When is the raindrop scheduled? I've spent about 6 hours of research on all this, this last few days, so this is good timing. I've spread the word also. I would like to note that Biquitous Jurisdiction is Wyoming, not Idaho. A BEOS Endowment Trust Fund will be created for this purpose, but it will not be managed on the blockchain like the existing BitShares Reserve Fund. Instead, it will be managed by a traditional legal trust fund, the BEOS Limited Cooperative Association ​(“BLCA”). This is for pragmatic reasons. A conventional board of trustees is able to make contracts, act quickly, and maintain commitment to a plan longer than a purely democratic process can achieve. This is a point I have been thinking for a while. Do you mind sharing any specific examples or reasons in the Graphene family or other blockchains which made you / BEOS reach at this conclusion ? Much like the need for the BTS foundation to be a face of correspondence, the need for signing contracts, and doing business in the real world necessitates that there be a legal entity of some type and representative in order to do such things. Hence the choice for the creation of the BLCA. Glad to see you put this in position before launching the chain. Steemit's struggle to set one up after launch of Steem blockchain serves an example how not to do it. My bts is all mortgaged, can it rain even if it can't be extracted. Unfortunately, no. BTS must move to the BEOS chain. Couldn't you accomplish a similar goal by issuing a BTS token on EOS and giving BTS holders the issuance of coins? Why does BEOS require a separate blockchain? Just curious and trying to learn why this method is superior over a simple token distribution. BEOS requires a separate blockchain so we can modify it to interface with BitShares as necessary without requiring changes to BitShares or EOS. It also needs to be able to implement jurisdictional agility which required special signing nodes. Finally, this method allows us to restrict tokens to users of BEOS who are willing to move their tokens there. It's a way to eliminate those who don't like or trust us from getting control of voting shares. We give them only to true believers.